Lotus Notes was a revolutionary product for its time, enabling the rapid creation of collaborative applications. But with 20 years under our belts, Lotus Notes is becoming more of a burden than an advantage. For many its outdated user interfaces, unmanageable application portfolio, poor scalability, lack of a relational model, and the dissemination of data through multiple silos, are all contributing factors turning Lotus Notes into a liability. Not to mention the evergrowing licensing costs. 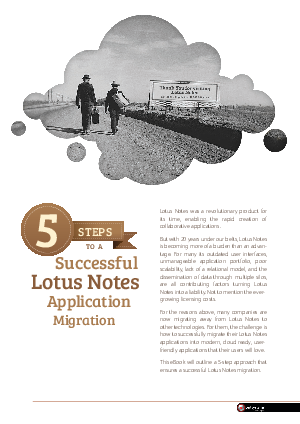 For the reasons above, many companies are now migrating away from Lotus Notes to other technologies. For them, the challenge is how to successfully migrate their Lotus Notes applications into modern, cloud ready, userfriendly applications that their users will love.